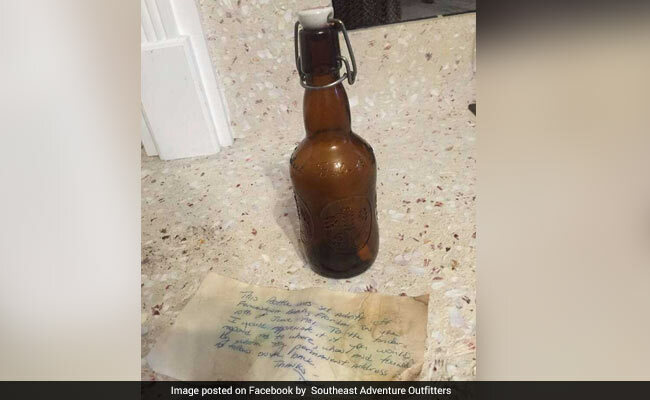 "This bottle was set adrift off Fernandina Beach, Florida on the 10th of June, 1981." Ryan Burchett will meet Douglas Stephens in August to return the bottle. Douglas Stephens set adrift a message in a bottle in the summer of 1981, at Fernandina Beach, Florida. Now, over 36 years later, he is all set to be reunited with it. Ryan Burchett was collecting shells at Little St Simons Island, Georgia, when he came across the little glass bottle with its ceramic top on June 17 this year. Inside it was a handwritten note from Douglas. "I could see there a message in it and I was like, 'Holy smokes'" Ryan told ABC News. The note read: "This bottle was set adrift off Fernandina Beach, Florida on the 10th of June, 1981. To the finder, I would appreciate it if you would respond as to where, when and found by whom. My permanent address is as follows on the back. Thanks, Douglas H. Stephens." One small problem: Douglas did not live at the address given anymore. That is when, according to ABC News, Ryan decided to ask Southeast Adventure Outfitters, an eco tour company, to post the pics on their Facebook page in an effort to reach out to Douglas. In less than 12 hours, the two men were in touch. ABC News reports that they plan to meet in August so Ryan can return the bottle to Douglas. "I think that's the most exciting thing - to give the bottle back," said Burchett to ABC News. "I'm more excited about that than when I found it."